Aptera's lawn care in Lake County helps you keep a well maintained yard year round. If you are like most people, you just don't have the time for lawn mowing, weeding, trimming, fertilizing and all that goes into creating a beautiful lawn. Thousands of customers every month rely on Aptera when they need a lawn care company in Lake County to care for their yard as if it were their own. Maybe you are a do-it-yourselfer who enjoys taking the time to work on your lawn's appeal, but you are ready to pass the rake for a little help in some areas. Or, perhaps you are a busy go-getter who does not have the desire to decipher whether a plant should be cut back or left alone, and would prefer someone just do the lawn work while you tackle the projects you most enjoy. Basic mowing service - Frequency of your lawn mowing will vary based on seasonality and grass type (see below for grass type info & identification). Most warm-season grasses including Bermuda and Zoysia should be kept at a height of 1.5 – 2 inches. Cool-season grasses including Fescue and Bluegrass do better around the 2.5 inch mark. Weekly or bi-weekly lawn service in Lake County will maintain these lengths during spring, summer and into fall. (Includes edging and clean up). Seeding and fertilization - to keep your lawn lush, green and healthy, seeding is done in the fall while fertilizer can be applied four or more times per year. Fertilization helps keep your plants healthy and strong so they can naturally fight off damaging organisms, bacteria, viruses, and fungi. Fertilizer granules should be spread across Lake County lawns every 6-8 weeks during the growing season. For smaller areas of your yard the lawn care expert may decide that spray fertilizer is sufficient, though its affects do not last as long as granules. Most synthetic fertilizers have been formulated to release over time to provide a long-lasting solution to reduce the frequency you need lawn care in Mentor, Willoughby, Painesville and Eastlake. For homeowners looking to go green, organic fertilizers that include manure or crab meal are also available. Let a pro customize your fertilization plan fit for your yard and plants. Leaf cleanup - Autumn leaves on your lawn may look great, but if not removed within a few days they block sunlight to the grass and can be devastating to the health of your lawn. Mulching - for most yards in Lake County, mulching should be done once a year, in early spring. Careful mulching helps your plants and shrubs retain moisture while adding needed nutrients back into the soil. Mulch also stops weeds from invading. You will have plenty of color tones to select from to match your flower bed and bushes, but Aptera lawn care services in Lake County recommend only using hardwood mulch because it lasts longer and stays in place better than lighter woods. Weeding - Necessary on even the most well kept lawns in Lake County, we recommend manual weeding and avoiding weed killers if possible. Some, like Mallow, Ground Ivy, Red Sorrel and Broadleaf Plantain are easier to manage than grittier species like Crabgrass and Carpetweed. Tip: Grass that is professionally seeded and fertilized and maintain a strong root system will actually force out weeds and significantly reduce their occurrence. Aeration - Yearly lawn aeration helps break up lawn-suffocating thatch and improves water drainage. Lawns that receive high foot traffic or with pets can benefit the most from consistent aeration. Sprinkler System Maintenance - Irrigation is critical to ensure plants and grass are not over-watered or under-watered. Pets, wind, accidents and normal wear and tear can wreak havoc on sprinkler systems. Aptera lawn care services in Lake County can repair and install all top brands of irrigation systems including Rainbird, Toro, Hunter, and Nelson. When choosing a lawn care company in Mentor, Willoughby, Painesville and Eastlake, be sure to inquire about the experience of the company's workers. Aptera lawn care professionals can tell you what breeds and types of plants and shrubs you have, how to take care of them, and how often services should be completed for optimal lawn health. Using the wrong tool or chemicals on your yard can be the difference between a beautiful, healthy yard and a brown, unsightly mess so it is critical you work with experienced, reputable experts. The best Lake County lawn care service doesn't need to be the most expensive either. Aptera has many providers with a long history of outstanding service, great customer care all at very competitive rates. Always make sure each bid for work provides a detailed explanation of the lawn care service they will provide including all material and labor costs. Most lawn companies in Lake County will also provide à la carte services to supplement your own lawn care regimen. What Type Of Grass is Best For My Lawn? If you want year round grass that lasts through each season, look for breeds like rough bluegrass and perennial ryegrass. They can withstand cold temperatures and seasons very well. Evaluate your soil to determine whether it is capable of providing nutrients for the type of grass you want. Certain types including Bahia and Buffalo Grass require richer soil to establish their root systems, grow consistently and in-growth from other breeds. Select a breed that your neighbors have to avoid growth. For example if you choose Bermuda Grass for your lawn in Lake County but your neighbors all have Carpet Grass it will be difficult to keep them separate for long. To make the best of whatever type of grass your lawn currently has, Aptera professionals monitor the health of your grass and the soil beneath it, prepare it for changing seasons, and create a mowing schedule that delivers the best possible outcomes year round. Aptera recommends keeping people and pets off of areas where any type of lawn care chemical has been applied for at least 24 hours. After this time it is safe for children and pets to enter the area. Will You Bag My Grass Clippings? We will bag clippings upon request; however, our experts use mulching mowers so that clippings are fine enough to decompose on the lawn. This is a natural method of feeding your lawn. Will You Always Send the Same Technicians? We try to send the same technicians on each visit. They will become accustomed to the unique qualities of your lawn which allows them to treat your lawn in the most effective manner and detect problems quickly. Will You Come on the Same Day Each Week? 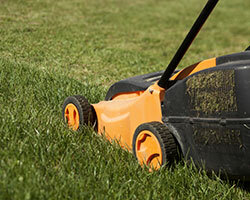 We try to schedule lawn services in Lake County on the same day each week. Notification is provided for scheduling changes or conflicts. Do I need to be home when service is provided? It is not necessary for you to be home, but please ensure all pets are contained indoors and that we have full access to all areas of the lawn that need service. Are Lawn Care Companies in Mentor, Willoughby and Painesville Required To Be Licensed? Federal law requires licensing for any professional who applies pesticides. Lawn service companies in Lake County who do not work with pesticides generally do not need a license. Yes, make sure any company who does work on your property is insured to reduce your financial risk in the event of an accident or injury. In addition to a good lawn mower, a lawn care professional utilizes many types of lawn and gardening equipment for very plant and season specific tasks without causing damage to lawns and surrounding plants. Safety tip for do-it-yourselfers: nearly everyone remembers to wear gloves, but eyes really need protection the most from serious injury. So be sure use goggles when using lawn tools. Edgers - For both manual and power edgers, operation is simple. Simply place the blade in the grass and the edging guide on the concrete, then move forward to create a clean edge of turf along sidewalks and driveways. Weed Whackers - Also known as weed eaters or string trimmers, a weed whacker quickly removes areas of overgrown grass and weeds along buildings or in areas that a mower cannot access. Most modern weed whackers have a string cartridge or plastic blade which rotates at high speeds to cleanly cut weeds. During operation, the gas or electric-powered equipment is held with the head parallel to the ground while using a side to side motion to remove the offending tufts of grass or weeds. Leaf Blowers - Great for saving time on large yards to quickly blow leaves into a pile for easier raking. They are also useful for blowing grass clippings and other debris from flowerbeds or driveways. Rakes, Shovels, Hoes and Handheld Tools - Most homeowners have these simple tools in their garage but professionals have them in greater size and variety. You may see your gardener using a trowel, pruner, or a bulb planter depending on your plants. Spreaders - For large lawns, a broadcast spreader will easily spread grass seed and fertilizer. The broadcast of the spread can be adjusted with a small dial located on the handle of the spreader. A drop spreader leaves a path of seed or fertilizer as it rolls across the lawn. Great lawn service in Lake County will leave you with a thriving lawn that reduces allergen-contributing particulate matter, provides erosion control, and acts as a natural water purification system. Using a professional lawn service in Lake County from Aptera to improve the health of your yard can save you time and even money so get started today. For more check out these sources: on erosion control, aeration and identifying weeds. Mentor lawn care costs $655, lawn mowing service costs $291. Willoughby lawn care costs $653, lawn mowing service costs $290. Painesville lawn care costs $691, lawn mowing service costs $307. Eastlake lawn care costs $726, lawn mowing service costs $322. Wickliffe lawn care costs $666, lawn mowing service costs $296. Madison lawn care costs $619, lawn mowing service costs $275. Perry lawn care costs $742, lawn mowing service costs $330. Estimated Lake County lawn care costs include all labor and equipment including mowers, hedgers, pruners and weed killers/pesticides. Does not include the cost of mulch or fertilizer.